Add a little edge to your step with these metallic shoes. Whether it's shimmering golden sneakers, steel studded heels or metal plated dress shoes, there's a pair of shoes here that will fit your style. Be warned, however, as it's a bold move wearing metallic shoes. These aren't the type of footwear options that go over well in conservative settings or on conservative dressers. There's a plethora of studded metallic shoes. 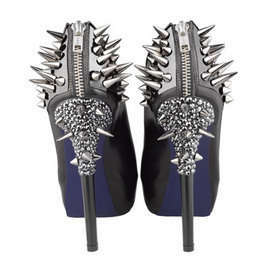 Often high heels are adorned with metal studs in a variety of patterns, which adds a new dimension to the shoe design. They are often placed in geometric patterns, which can add new lines and definition to the shoe's look. Sneakers get the metallic treatment too, but more in metal-colored shimmering designs.